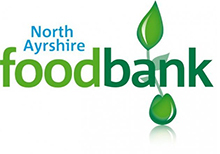 North Ayrshire Foodbank is a provider of food to those in crisis within the local authority area of North Ayrshire. This happens across a range of services either based within the Ardrossan Church of the Nazarene or across the local authority area. This includes a three-day a week community café, the five-day a week Foodbank, the weekly GRUB club, the “Make a meal of it” project that operates during school holidays plus our two aspirational projects – the Urban Farm and the Community Supermarket which we are developing. In addition, we have two projects relating to media – the Cultural film group and the mobile cinema. The first is to make a film about North Ayrshire thanks to a grant from Digital Inclusion and the second is to income generate whilst giving access to a cinematic experience to those least able to afford it or furthest away due to rurality. • Community Café: Assist in the preparation and serving of food to community café users who primarily cannot afford the cost of meals (free if unable to donate). Setting café up and cleaning at end, making soup, serving hot and cold meals. • Foodbank: Processing donations – weighting in, date checking and putting into stores. Packing boxes for clients as per guides (100 per week). Supermarket collection events throughout the year need participants to gather food in. Data collection by inputting beneficiaries information from vouchers encased for food. • Make a meal of it: Skilled individuals sought to entertain and/or informally educate the children in a fun and entertaining way as part of the activities programme. Holiday periods only (Summer, October, Christmas and Easter). • Community Cinema / Film Making: Drivers to take cinema on the road. Media/historians to devise and create an original film about North Ayrshire.